Every opening is an opportunity. Whether it’s simple cabinetry and casework or something more, Häfele America Co., one of America’s leading suppliers of furniture and architectural hardware components, has brought art and innovation to the act of opening and closing a door—no matter the space. The purpose of a key product group such as Häfele’s own Free family of flap fittings is to allow for a cabinet door to be lifted, tilted, swiveled or folded above the user. This unique action means the entire contents of your cabinet are fully available each and every time you open it. An added bonus is that even in narrow, galley-style kitchens activity never stops for a swinging cabinet door. What’s even more fantastic is some versions can open and close with the touch of a button. Equipped with feather-light movement, soft open and close, multi-position stop and push-to-open technology, Free flap fittings are an innovative and elegant addition to any kitchen project. Installers of Free products also love the products as most can be installed with one hand. Installers just put it into place and zip in some euro screws. 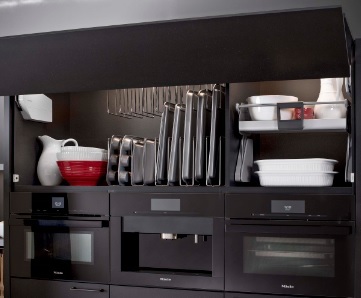 Another option for stylishly enclosing your cabinetry is our Clipo with glass. This product takes all the pain and frustration out of building custom glass doors for cabinets and other applications by being made to your exact specifications. Häfele’s unique order and assembly process allows for a quick turnaround—always a bonus for designers and contractors working on custom projects while on a tight deadline. Combining outstanding functionality and space-saving prowess is the Frontino coplanar door hardware. Available for both upper and base cabinets, this versatile hardware option features integrated soft open and soft close for doors up to 88 lbs. each, making it ideal for cabinets to store everything from barware to grandma’s priceless heirlooms. For larger enclosures—even those that stretch floor to ceiling—choose the Hawa Concepta. This set of pivoting pocket door hardware can either make a statement or merely conceal one. That makes them perfect for enclosing everything from a butler’s pantry to your washer and dryer or practically anything else. Available in standard or bifolding designs, the Concepta is easy to install, can be adjusted without the need to open panels and can sustain very heavy doors because of its unique scissor technology design.